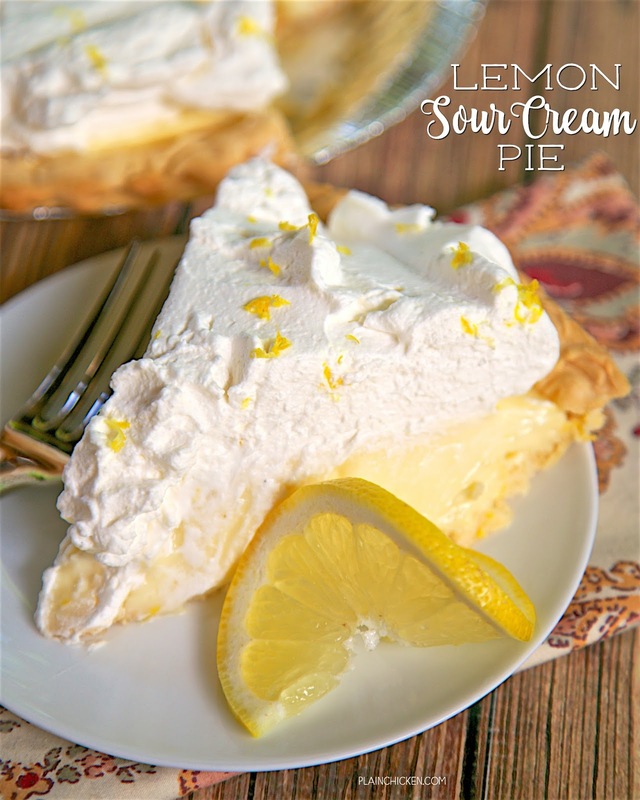 Lemon Sour Cream Pie - quick homemade lemon and sour cream filling topped with fresh whipped cream. SO light and delicious! A new favorite!! Great for potlucks and the holidays. This recipe was inspired by our trip to Portland this spring. We went out to Portland for the Indulge Conference. We had SO much fun eating around the city. One of our favorite spots was Tilt. Lauren, who put on the conference, recommended it to our group for dinner. She said the burgers were great and to make sure we got a slice of the Lemon Sour Cream Pie. Lauren was right the burgers were great and the Lemon Sour Cream Pie was not to be missed. 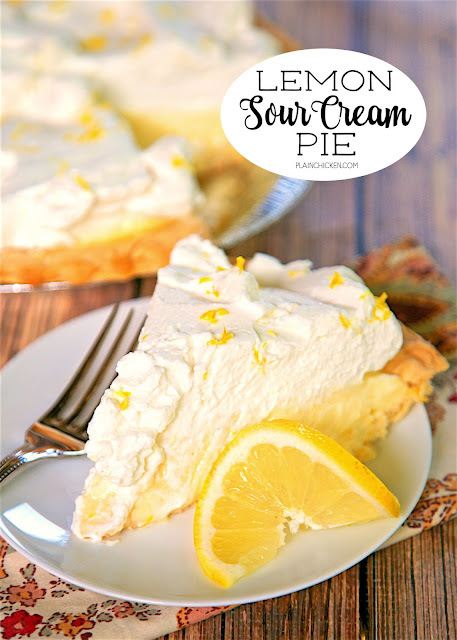 I had never heard of Lemon Sour Cream Pie, but I am now a huge fan! It was crazy good. Even though I was stuffed from everything we ate for dinner (and breakfast and lunch), I managed to wolf down a piece of the pie. SO good! I knew I had to come home and make my own version. The pie was really easy to make. You could make the filling a day ahead of time and spread it in the crust when you are ready to serve it. I love to top my pies with fresh whipped cream, but you could also use Cool Whip if you are in a hurry. Either way, this Lemon Sour Cream Pie will be at all of my summer cookouts, potlucks and at the holiday table this year. Enjoy! Bake pie shell according to package directions. Cool on wire rack. In a small bowl, whisk a small amount of hot mixture into egg yolks; return all to the pan, whisking constantly. Bring to a gentle boil; cook and stir 2 minutes. Remove from heat. Stir in butter and lemon zest. Allow to cool 15 minutes. Stir in sour cream. Add filling to crust. Place the heavy cream in a chilled mixing bowl. Whip until the whisk begins to leave tracks in the bowl. Add the sugar and vanilla and whip until the cream holds a medium peak. Spread on top of pie. I too love to top my pies with homemade whipped cream, but how do you keep yours fresh? Within a day or so, the whipped cream essentially breaks down and gets watery on top of the pie. I tried to click on the "printable (printable recipe) but it didn't work. Also on a side note, there are so many adds popping up on your blog that it's hard to read your post. I fixed the printable recipe link. Also on a side note, none of the ads on my site are designed to pop up. The only pop up is for the email subscription. Regarding keeping whipped cream longer, try adding unflavored gelatin. I use it often and it holds the whipped cream together. It's called stabilized whipped cream. I finally convinced my husband to make one of his super flaky pie crusts, so I could make this pie for a dinner party. Everyone loved it. Great recipe!